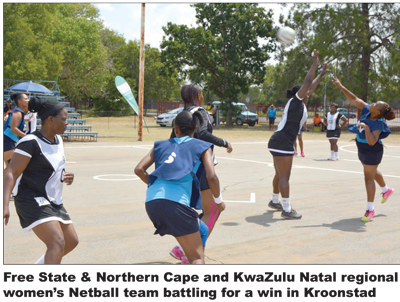 Kroonstad became a hive of activity during the DCS National Netball Championship which took place from 03 to 08 March 2019 in the Free State Northern Cape Region. All six regions were represented by male and female teams. The regional teams were nip and tuck during the games and displayed a professional and fierce competition. Gauteng’s female team triumphed, taking first position and best shooter. 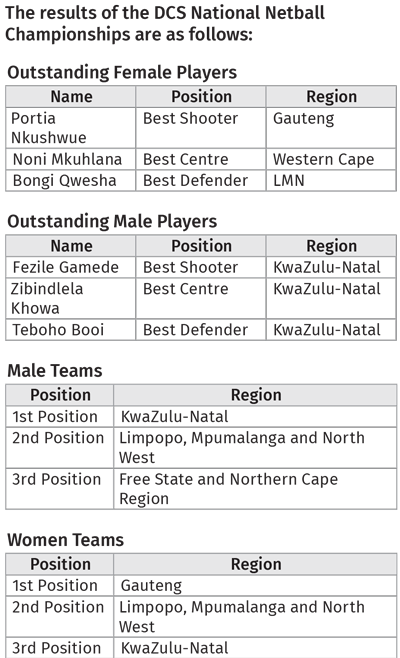 KwaZulu-Natal’s male team took the first position and scooped the trophy for best shooter, best centre and best defender in the male category. On the third day, the participants were treated to a gala dinner where winners and the new National Executive Committee for Netball were announced. Director Employee Wellness, Pravesh Bhoodram said the event provided netball players with the opportunity to learn and better their skills such that they could also participate at higher levels like the National Netball South African Championships. The President of Netball South Africa, Ms Christine Du Preez was also present and she praised the DCS Netball National Executive Committee and Directorate Employee Wellness for the efforts put into making the event successful. 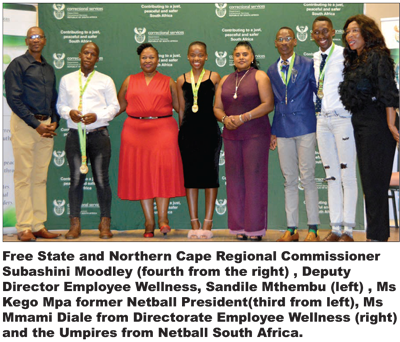 Free State and Northern Cape Regional Commissioner, Subashini Moodley said the comradeship and teamwork that the teams displayed during the championship should be carried back to the workplace. She said officials should watch each other’s backs like they did on the sports field. Ms Kego Mpa, the National President of DCS Netball who handed over the baton spoke about the challenges that the sport is facing and what was needed to make sure that netball is recognised and supported. RC Moodley took the opportunity to announce the exciting news that South Africa had won the bid to host the 2023 Netball World Cup. She said the hosting will bring a lot of opportunities for South African netball and she encouraged the DCS NEC to start planning, positioning and aligning the department for those opportunities.